I would have gone the route of Captain & Tennille. More stopping power, like an unjacketed .40 wadcutter. Noticed HAD is spending a lot of time on instructables lately… I hate instructables. Not sure if you noticed this too, but there is a total of zero people that give a sh*t about what you do or do not like on the internet. It is a neat tweak who cares where it is posted? Good for you, I love when people can think for themselves! Rebel! Go against the grain! Fight the power! To hell with mainstream garbage filling our downtrodden minds! Hipsters all the way! We are the 99% ! We are Anonymous and we are legion! FYI: Broadcasting ANY commercial music to a crowd is against the law unless you have the proper (expensive) licensing. Use mosquitto tones and public domain polka accordion music, you’ll clear out them occupy protesters PDQ! The idea of a megaphone blasting mosquito buzz made my nose bleed. I’m not sure many people care. Also find an open source VUVUZELA.WAV and get cracking! 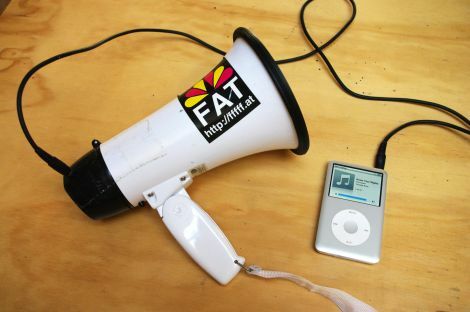 Is it the megaphone that played nyan cat song at the last CCC camp ? This seems like something black metal musicians would use in the recording process.